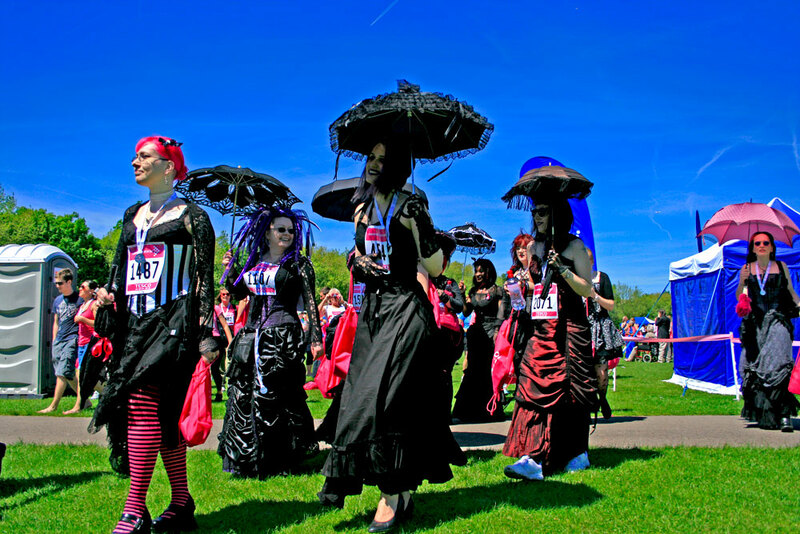 Simon Lamrock writes "It's been a whole year since I spotted a goth in hot weather, then today I catch a whole tribe of them!" Well done Simon, glad to see the home team being spotted so well. 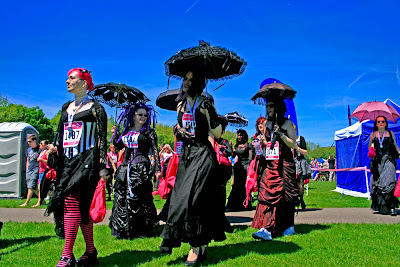 And special congratulations to the gorgeous darklings of London Gothic for entering a charity race dressed in all that taffeta! The brightly coloured runner's numbers really set off the maroon and black, girls. Extra points too for the gothasol carriers, but hang on, what's that? White trainers? Disqualified! with a slight detour to the London Marathon, and at that pace, they may just be n time for the Slimelight. BTW, your rating text is practically invisible! Hey, I thought the gothasol was out and the gothwing was in? *slaps forehead* Of course! If the gothasol is dead, all goths will cling to it with a laconic fervor. And with that thought, Manny, you capture the very essence of the Goth. Anachronism isn't easy to keep up with.